Several aspects of copper toxicity to Euphausia superba were examined. Baseline copper concentrations in Euphausia superba caught and frozen in the Antarctic was found to be in the range of 55.2-82.6 j.lg g-1, dry wt. Total body copper concentrations were measured in animals exposed to various ambient copper concentrations. 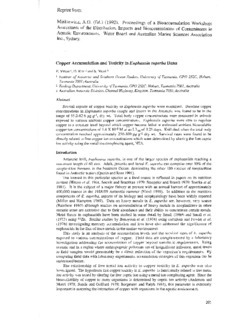 Euphausia superba were able to regulate copper to a constant level beyond which copper became lethal at estimated ambient bioavailable copper ion concentrations of 1.4 X 10-8M at an LT50 of 3.25 days. Krill died when the total body concentration reached approximately 250-300 j.lg g-1 dry wt. Survival rates were found to be directly related to free copper ion concentrations which were determined by altering the free cupric ion activity using the metal ion complexing agent, NT A.